Our next league match is away on Thursday 15th January at Wigston. We will, however, be playing at home as Littlethorpe D on Tuesday 6th January in the D34 League Cup (where we are at the top of the table, by the way). Our next match is at home against Ashby 3 on Tuesday 16th December. Tonight we moved into the top half of the table. Dave held on in a King versus King and Pawn endgame. I ground out a win against Stan over 62 moves. Ray was in control from very early on. Aaron met Dominik, the Red Admiral's, rapidly improving, 8-year old secret weapon. Red Admiral (2) 1.5 Points, Littlethorpe (5) 2.5 Points. with littlethorpe 3 already languishing at the bottom end of division two , the trip to braunstone seemed like a daunting prospect. already though this season our 3rd team have produced some battling performances to gain our cherished two points in matches where the grading would suggest an easy win for our opponents. most notably with the help of our two top board subs steve wylie and graham booley we were able to gain an unlikely draw with table toppers melton 1.
however with steve and graham both unavailable braunstons team of paul (157) shrif (159) mike (159) tony (139) and john (126) looked a daunting prospect , but everyone managed to put on a worthy performance , with a team result that probably flattered our opponents slightly.most notably, possibly , was a battling performance by lloyd clarke against mike salisbury to take mike right to the end in a battle against time and a past pawn. the third team captain didnt want to get involved in the physical exertions required in a battle against the clock (which he surely would have lost ) and chose to offer a draw with 9 moves to make in 2.5 mins , luckily his opponent had the same dilemma and accepted the draw. george put on a very solid performance against tony to gain our only win of the night , well done george. Next match is away against Red Admiral 2 on Wednesday 26th November. We lined up for the third match of the season still looking for our first victory. Chris Gibson had to drop out through work, but Brandon's amazing run of form has seen a grading performance of 196 and so he has been propelled to the heady heights of 1st team board 1 - possibly the first twelve year old to do so in the league. Battle commenced and Steve Wylie quickly saw himself the exchange up, but at the cost of having to defend a viscious attack whilst the other boards were pretty sedate. Brandon was first to finish, gaining a nice positional advantage which he was able to nurse through to a full point. An impressive win as it shows there is much more to his game than pure tactics which is bad news for the rest of us! 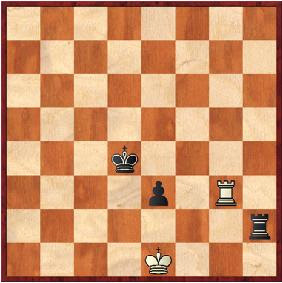 I learnt from the master Dave Ricketts how to draw a rook and pawn ending two pawns down. In truth, my opponent let me off the hook but it was my birthday! Steve then won his game, having defended his opponents attack well and coming out of it a clear piece up. Dave Bray's game was fairly even and with both players short of time in a Knight and Pawn ending a draw was agreed. Now comes the clever bit. Shove your rook down to the eighth rank. Why? Well, whatever your opponent does now you are going to check his king from the safety of the eighth rank. 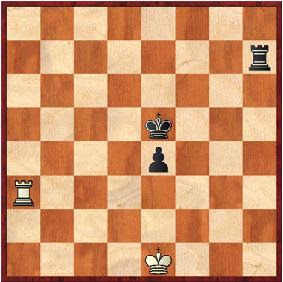 The King cant leave the pawn undefended or you will just attack it with your rook and win it, and so the king can never escape your perpetual check as he can't hide in front of the pawn either. Neat! It's never straightforward when we play Wigston is it? Probably never will be either! It all started well enough. We had a decent second team out, although nothing of the strength of Wigston - hopefully we could give them a game. The games all looked quite close and interesting early on. After about 45 minutes of play Alan Byron and I had rattled out 20 moves of a closed Ruy Lopez (I did joke that Alan must have picked up the wrong piece when playing e4) whilst Pete Harrison and Martin Burrows had played 4 moves each! First to finish was Dave Bray drawing with Walter Dehnen. Then Mike Cowley drew with Andy Morley. At this stage I was level with Alan Byron, Pete was struggling against Martin but Graham Booley was duffing up ex County Champion Alan Ward. Then came the controvesy. Both Alan and Graham were short of time (3 minutes and a bit vs 5 minutes and a bit). Alan played a move and Graham instantly played his reply when a Wigston player stepped in to tell Graham that he had to write Alans move down before playing his own. This intervention didnt go down well with either player but they carried on, only for the watching Wigston player to do it again! This was embarrassing for him on two counts - firstly spectators should never interrupt a game in progress for any reason and secondly because he was completely wrong about the laws of chess (it's perfectly legal to play your move and then write down your move and your opponents afterwards). Hacked off at the destraction, and despite the fact that he was completely winning Graham had had enough at this point and offered Alan Ward a draw who of course accepted. In fairness to Alan, he was just as disturbed by all this as Graham, and in fact afterwards offered to resign the game (I dont know if this was accepted by Graham who has gone on holiday to recover!). Why does it always have to happen against Wigston? Pete eventually succumbed to Martin and Alan Byron got the better of me at the end after a great struggle but events on Board 5 left a bitter taste - again. * Maybe! Or it might be a draw. Littlethorpe D (aka Littlethorpe 5) travelled to Syston for the first round of the League 3/4 Cup. On paper, the sides were evenly matched - so no bonuses. Colin, Aaron and Herve all won their games within a few minutes of each other, shortly before 9 o'Clock. Ray, who had had to race up to Syston at the last minute, looked to have the better position with a Q-side connected passed pawn on the fifth, but then went pawn snatching, putting his queen offside and allowing his opponent's rooks in down the centre. Next week, Tuesday 11th, we will be back at Syston (as Littlethorpe 5) playing their 3rd team. We are clearly a team on form, so hopefully, we can achieve a similar result. The team was picked well in advance for the match against Scrappy Valley but my only concern was Brandon. He had returned from America only the day before and would play if he wasn't jet lagged. I texted and emailed mum but no reply, so I lined up Pete Harrison as deputy Wunderkid! As it was, contact was re-established with the Clarke household and Pete was off the hook. So off to Netherhall for another tight (on paper) encounter. Brandon was late, but he always seems to be! But where's Graham Sharpe? He's nowhere to be seen, and I don't have a phone number for him with me! The of course (and all captains will know what I mean) those thoughts run through my head - I did email him, didn't I? He did reply, didn't he?? I even rang Graham Booley and got GS's home number but no reply - he must be on his way. Fingers crossed anyway! So onto the match. Graham didn't arrive, so we were 1-0 down at the start (later, I received an email apologising as something had come up at school at the very last minute – these things happen). My game lasted barely 45 minutes. I'd like to tell you that it was a brilliancy of such magnitude that I must post it here for all to see, enjoy and learn from. I'd like to say that, but sadly the truth is that my opponent simply put a piece en prise! Not 15 minutes after I had finished than so too had Brandon. Poor Ray Burgess had been well and truly put to the sword. The following position occurred after only 15 moves and Ray (white, to move) is completely busted. In desperation he played Bxg4 and after the natural ..hxg4 Ray played Qxg4 no doubt hoping for some counter-play against Brandon's king. So, can you see what happened next? (answer at the bottom). Dave Bray against Roland Graf was an interesting battle which ended up K+R+2P v K+R+2P with the pawns on opposite wings. Roland had to give up his rook for one of Dave's pawns as both sides queened. Dave tried to keep his rook with tempo by giving a check but ended up losing it to a fork, and the resultant Q and Pawn ending was tricky but ultimately lost. Fritz later pointed out that the draw is achieved trivially by simply moving the rook to safety first, then sacrificing the rook for the remaining pawn at the earliest opportunity to leave K+Q v K+Q. A good lesson to learn! So, it all rested on Mike Cowley v Mick Tate. Mike looked to have the better of things but then Mick got some activity. Suddenly Mikes king was chased to b4 and a mating net looked like it was closing in. Mike was able to punch a couple of holes in that but the game was certainly double edged. With little time remaining a draw was agreed in an interesting position. A drawn match in a good, close competitive affair. Let's hope they're all like that! The answer in the Burgess-Clarke game is that black played the devastating ...Nde2+ when, after Kh1 the simple ...e5!! white's queen has lots of space around her, but no safe square to move to. Oh dear. A tight match, which we just lost out on. The team was carefully picked and selected, and travel arrangements made well in advance. All this went up in smoke on Tuesday afternoon however when two players from other teams became unavailable, and we had to do some re-juggling of teams! As it was, this meant that we travelled to Nuneaton with a stronger team that anticipated and, against the weakest side in the division, we were more than a match for them. Dave Bray's opponent couldn't resist a piece sacrifice on h7 which was unsound, although Dave had to defend carefully. 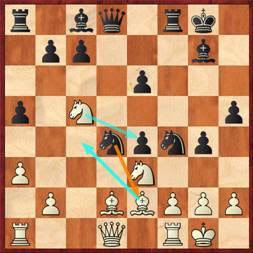 Alan Byron seemed to pick up the wrong piece on move 1 when he played e4! but got a crushing kingside attack and was winning from an early stage. The captain let the side down with a draw. I sacrificed a pawn for position but my opponent was happy to take a draw by repitition and I wasnt going to play a worse move just to avoid it. Dave Farrall and Alan Edwards both achieve material advantages and ground those advantages out for a point. So 4 matches, 7 points. A rest next week and then we play the three strongest teams University A, Nuneaton A and Coventry A in successive weeks. Should be interesting! Littlethorpe 5 Win First Match of Season. Following last week's 3-1 defeat to Oadby, Littlethorpe 5, this evening, won their first match of the season, at home, against Ashby 4. Dave won very quickly, Herve scored a well deserved win, the Captain blundered away his queen and the game from what had been a decent position, and Ray won his game convincingly giving us the match. It was all over before 21.30. Well done to everyone (except me, obviously). We have now had, 1 win, 1 loss and 1 draw. The loss and the draw being to teams we were heavily outgraded by. Our next league match is away against Syston 3 on 11th November but before that we have our first league cup match on 4th November, also away at Syton. A tight match on paper and so it proved over the board. Boards 1, 4 and 5 were always tight and all ended drawn. Mike came second best in a very sharp tactical battle with Paul Colburn, leaving me needing to win to save the match. We should have drawn as I should have won on board 2 but I misplayed my sacrifice, as I seem to do with everything these days! In the end, I wasn't so much lucky to draw but Jim must have felt sorry for me and gave me a draw even though I was totally busted! As it was, all 18 turned up to do battle the following morning - some looking better than others it must be said! The draw had been kind to us. The first team had FCA Solutions 2, the team that drew with the 2nd team the day before. The 2nds in turn had the 1st teams victims of the previous day whilst the 3rd team played Celtic Tigers 2 which on paper looked like it should be close. The first team wussed out big style, leaving it to John and Alan to bring home the points. Special mention must be made of Graham Hewitt. Playing due to illness to another player, he showed great endgame technique to win a tricky rook and pawn endgame. And it wasnt just me who thought that - Steady Eddie said so, so it must be true! So, we playing University B, perennial strugglers in the Coventry League. As it happens, we have a much stronger side than the one that we beat Rugby with two weeks ago so this is going to be a bit one sided insn't it? Then University arrived. First I saw Chris Russell (graded 180). Then I saw Tom Pym's name on the score sheet (192). I said to Steve Turvey (University player as well as Littlethorpe 4NCL regular) "I thought we were playing your B team!" Thats when he explained that they had recruited some good new players this year so had decided to run with two strong sides in division 1 instead of a strong and a weaker side. Good for the league certainly, tough for this match! So, the game starts and despite Mike Salisbury playing there are no early finishes. Its gone 9pm before the first result is in, a nice win for Alan Edwards. Then Mike draws (although he doesnt count this as a draw - apparently it was his opponent that made the offer!). Alan Byron is two pawns up in a nice position and converts the point - a good win against an improving youngster - leaving Brandon and Graham Sharpe playing. Both games have plenty going on but end up as draws to give us a nice win against a team that will take points off of other teams. On Tuesday, Littlethorpe 5 began its mission to conquer the fourth division. Away against Braunstone 4, we were outgraded on every board, but managed a respectable 2-2 draw. A fine start to the new Coventry League season saw the A team win 4-1. Not that it was really as easy as the scoreline suggests. We were soon 1-0 up when Sean's opponent missed an intermezzo and lost, then Brandon's opponent got a draw by repetition in a R+P ending. This left Alan Byron with a tight game, Dave Bray with a slight advantage and Pete Harrison a pawn down for very little. Alan agreed a draw, Pete's opponent blundered a piece and Dave won with a very nice mating net. Well done all!